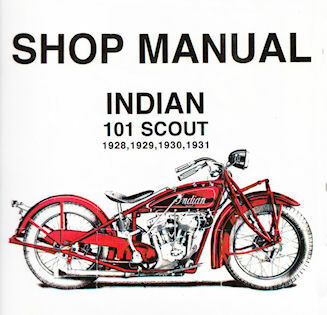 The Indian 101 Scout “Repair & Overhaul Manual” is copyrighted by The 101 Association, Inc. Also known as the “Shop Manual” it is designed to be used on the workbench. No manual of this type was ever produced by the Indian company. Many years ago the membership of The 101 Association, Inc. took up the task of producing such a manual. Page by page, year after year, it slowly become a reality. The manual is divided into fifty sections, basically the same way the Indian Parts Books are divided. Many people donated information, drawings and recollections of experiences with the Indian 101 Scout when it was in general use. By the year 2000, the 17th year of our Association, every section of the manual had been addressed. Since then “Tech Tips” have been produced adding more information to the manual. As of 2013 there are now Fourteen of these “Tech Tips” which are included as an extra folder with each manual shipped. Total pages are now 280. Association members get new “Tech Tips” with each issue of the WOW. Non-members may order the “Tech Tips” at any time. Also, soiled or missing pages may be ordered at any time. Membership in The 101 Association, Inc. is not required to purchase or update your manual although membership is certainly recommended. All prices are in U. S. Dollars and include shipping by air. The 101 Association, Inc., an historical non-profit corporation. As of November 23, 2014, you must be an active member of the Association to purchase the R & O. Please see Membership > Information to learn about the benefits of membership. See Membership > Application to join.